Padang Padang is one of Bali’s most popular surf beaches. With it’s crystal clear blue water and dramatic cliff side views it’s no wonder why. Our villa is located in the cliff looking over the surf, just jump off the rocks and you are right there. Book your Padang Padang Active Escape now! Meeting new people having a great time! There are two options for this location with different price points. The luxury villa consists of 6 bedrooms, over four levels with large balconies looking over the surf on each level. Large entertaining areas plus two huge swimming pools. This is where the training and the meals will be held. The hotel is 400m down the road has it’s own large pool and services but you will spend most of your time at the villa. Villa Twin Share: Room includes two beds with a shared bathroom. Or if you are traveling with a friend you can opt for a large king bed with share bathroom. 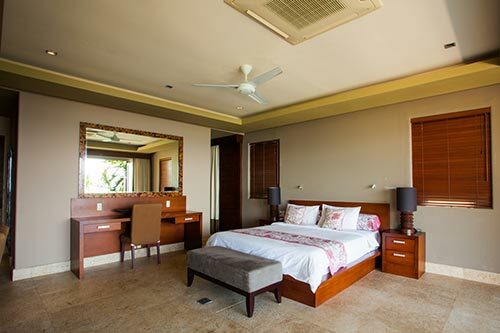 Villa Private: Large King bed with ensuite bathroom. Hotel Twin Share: Room includes two double beds with a shared bathroom. Hotel Private: Large King bed with ensuite bathroom.